This is a partial preview. Full document is 179 slides. View large preview. Do you want to spend less time on PowerPoint? Get our FREE PowerPoint Toolkit, which contains over 100+ slides worth of diagrams, shapes, charts, tables, and icons for you to use in your business presentations. To receive this free download, enter your email address below and click the "Email Me" button. 36-slide PowerPoint deck. Enterprise architecture: Description of an organization's business processes, IT software and hardware, people, operations and projects, and the relationships between them. 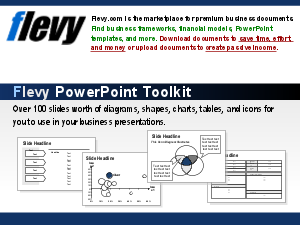 Get our FREE PowerPoint Toolkit, which contains over 100+ slides worth of diagrams, shapes, charts, tables, and icons for you to use in your business presentations. Business Framework PowerPoint Diagrams? Bain Presentations? Channel Distribution Strategy Example? Or something else.